The first operations on electronic chips implantation were held in Saint Petersburg Scientific Ear, Throat, Nose and Speech Research Institute. The microscopic audio processor will be essential for those who suffer from partial hearing loss. The main Russian otolaryngologist Yuri Yanov states that this chip provides a hearing rise to up to 90 percent from the norm. 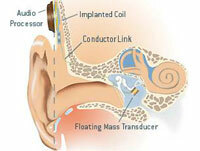 The author of the hi-tech decision is the German company Medel, a monopolist in the acoustic implantant industry. The chip is implanted under the skin near the temple; the magnet in the outer side holds an audio processor. The resonator is put in the inner ear. Read also: "Russian dentists implant prosthetic fang to Siberian tiger"
According to engineer Spartak Megremishvili, 5 such devices have been purchased so far. The first surgeries are free of charge. The first 3 chips are already implanted. The results of the transplantation can be seen only after the tissue is healed and the audio processor can be tuned. However, further on not everyone will be able to afford the surgery. The chip implantation is to be 15 thousand dollars worth. Note that in the last 2 years 2500 similar surgeries were held in Europe. According to WHO, 13 million Russians have hearing disturbance. Among them there are 1 million children.